The Plastic Pollution Movement is very new. The problem developed within our lifetimes with the explosion of single use plastics thanks to mankind's acceptance of a fossil fuel based economy and increasingly disruptive extraction methods for petroleum and natural gas such as fracking, off shore drilling, and tar sands extraction that have produced a glut of petrochemicals we have used for both energy and products that harm our climate, wildlife, oceans, food chain and poison us. The South is characterized by "look-the-other-way environmental policies and giveaway tax breaks." It is our nation's Third World where political bosses encourage outsiders to buy the region's human and natural resources at bargain prices. Lax enforcement of environmental regulations have left the region's air, water, and land the most industry befouled in the United States...Ascension Parish (Louisiana) typifies what many people refer to as a toxic 'sacrifice zone.' In two parish towns of Geismer and St. Gabriel, 18 petrochemical plants are crammed into a nine-and-a-half-square-mile area. Petrochemical plants discharge millions of pounds of pollutants annually into the water and air. Louisiana citizens subsidize this corporate welfare with their health and the environment. I believe it is very important to study the history of other historical movements to learn how to be effective in stopping plastic pollution. What tools are effective? How can we defeat obstacles? As I am from the South, where I grew up in the first desegregated class year in Tennessee thanks to federal intervention, I think of the civil rights movement for inspiration and direction, and I also look to the equal rights to marriage movement which has been phenomenally successful in such a short time in moving popular opinion and thus achieving legal change. I have adopted several strategies through my life from marching in the streets to drafting legislation, lobbying, and making art, and come to the conclusion that all these strategies are useful and should be pursued at the same time. We need to reach the public to put pressure on our leaders. But we live in very complicated times when our voices, our voting power and our very democracy is threatened. Just like our addiction to harvesting fossil fuels underlies our plastic pollution problem, the solutions to this problem (alternative energy, toxics reform and pollution control) have an underlying threat and that is money in politics with the Supreme Court decision Citizens United blessing the whole corrupt system. We also live in a throw away era when we think that continued economic growth is possible and good despite our limited resources. We live in an era of cheap products designed to be thrown away after single usage and of expensive products designed to be replaced with new models after a year or so. Most frighteningly, we live in a time when human beings are thought of as disposable - - pawns of wars to get access to more fossil fuels, or thrown away in jails with no education or training, or suffering making less than a living wage as we compete with foreign economies with little or no pollution controls or workers' rights. This all must change if we are to survive as a civilization and a species. So if we have to fight the Exxons and Chevrons and Dow Chemicals of the world, with their vast monetary power that buys political power, we need to work simultaneously to retake our democracy through campaign finance reform, education, social justice and fighting the increased power of corporations. In the meantime, we need to be very creative in how we reach the public so that they can be informed and demand that their leaders protect them, regardless of how much money those leaders have taken from those who care more about immediate profits than our long-term survival. Recently, I participated in The Plastic Gyre Symposium at Georgia State University and The Center for Disease Control (CDC) in Atlanta produced by Pamela Longobardi and Dianna Cohen. The CDC presented a marvelous exhibit uniting art and science showcasing art made from plastic pollution with brilliant text describing the threats from plastic pollution to human health, wildlife and the environment. Atlanta City Councilmember Kwanza Hall, an MIT alumnus who is a big supporter of the arts in Atlanta, delivered a proclamation at the CDC declaring the day Plastic Pollution Reduction Day in Atlanta. 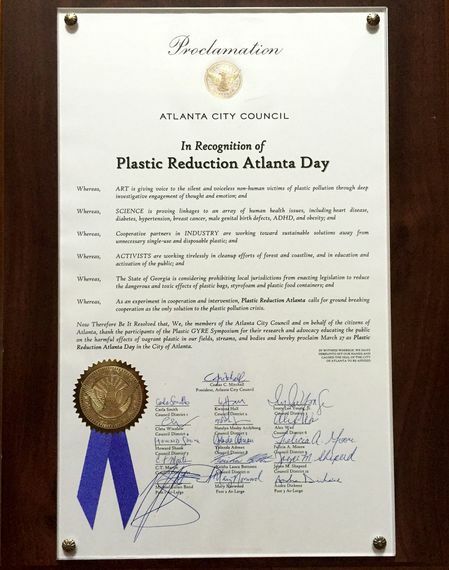 After Heather White, Executive Director of Environmental Working Group, introduced me as a speaker, and before I took the podium at the CDC, we were notified that the Georgia State Legislature had defeated Senate Bill 139, an attempt to prohibit local plastic bag bans in the State of Georgia. This strategy to "occupy the field" with state legislation prohibiting plastic pollution controls at a local level has been used in other states, notably nearby Florida. We were delighted that Georgia's legislators rejected SB 139. Banning prohibitions on plastics bags is clearly not in the health and well being interest of Georgians, nor in their interest as taxpayers as their taxes pay to clean up plastic pollution. This money can be better spent on teachers, police, parks, but lobbyists for the petroleum industry have bought power over some state legislators. Perhaps the petrochemical industry is fearful of decreased demand for their product as two states are already plastic bag free: California and Hawaii. The petrochemical lobbyests don't give up once a bag ban law is passed. In California, after Governor Brown signed the California Plastic Bag Ban, industry paid for signatures to get a referendum on an upcoming ballot seeking to overturn the bag ban. There are many ways to fight plastic pollution: through public education, art, documentaries, demonstrations, lobbying our leaders, and through legal policy. To see how art can make a difference please watch the National Geographic Short Gyre. To see a primer on how legal solutions can stop plastic pollution, see my TEDx Talk. If you want to see articles on Plastic Pollution by several of the experts who spoke at The Plastic Gyre Summit like Charles Moore and Marcus Eriksen, please order the e-version of the first Law Journal on subject of Plastic Pollution that I helped produce at my alma mater Tulane Law School. There you will find model Plastic Bag Ban Legislation and Plastic Microbead Ban Legislation. We all have different tools in out tool boxes that we can use to fight the power of corporations that place short-term profit over the long-term health and well-being of people and the planet. The time is NOW to use all that we have to stop plastic pollution.